An expertly crafted summer direct mailer from SmartEtailing can garner a 10 times higher response rate from potential customers than social media. 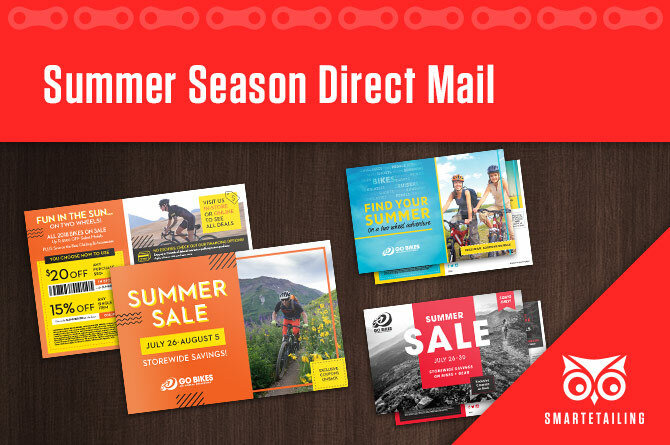 If your goal is to capture peak season bike purchases, increase customers during your key summer sale dates, or attract new customers to your business – there is a direct mail tool that will help you accomplish your goals. Our system will rank and sort your mailing list to bring you the most qualified shoppers. These customers are ready to buy, which makes them a prime audience for Summer Sales and other seasonal promotions. We carefully track return on investment for each direct mail campaign. Over the last 5 years, our summer direct mail campaigns deliver an average return on investment of 219%. Per campaign, 200 coupons are redeemed with an average of $121 in net sales per coupon. This often results in an average of $57,568 in gross sales. For most regions, summer is prime selling season with numbers starting to trail off in August and September. Summer promotions help capture that energy while also helping you clear out inventory before things slow down in the fall. We have pre-designed mailer options to support promotions in addition to proven customer loyalty offers to drive your best customers back to shop with you. We can offer expert advice about which tool is right for your business. Give us a call today for a free consultation and let our direct mail team find a solution for you. Orders are due by July 2nd for most Summer mailer efforts, so contact us right away so we have ample time to collaborate on an effective marketing campaign.